Finlaystone attracts over 3,500 school and nursery children every year who visit for fun and education. Our Rangers work with teachers in arranging activities to promote an understanding and appreciation of our natural surroundings. Finlaystone Country Estate comprises 150 acres, of which 10 acres are formal gardens and 140 acres are mixed woodlands with a network of trails, play areas, pond and burn with spectacular waterfalls. The Visitor Centre is the wildlife centre with displays and houses the ‘Dolly Mixture’, accessible toilet and a gift shop stocked with goods, many at pocket money prices. Each class will be allocated a 15-minute time slot for the shop. The ‘Dolly Mixture’ is a doll museum with an international collection of dolls collected by the MacMillan family. A mixture of dense conifer plantations and open broad-leaved woodlands cover the estate complemented by their associated woodland flora and fauna. Woodland clearings provide areas for BBQ’s, picnics and play. Throughout the woodland are extensive timber play areas from fort & wigwams, tram, train and pirate ship to slides & swings for the younger visitors. Please wear suitable clothing for the weather. Wellington boots are advised for some activities in the forest. We recommend midge repellent, they love joining us! Sun cream for sunny days and your packed lunch if you don’t buy our packed lunches from the Tea Room (see blow). Packed lunches can be provided by the Tea Room on request for £3.50 per child. To order call Jill on 07795606730. A discounted price can be offered to large school groups. A discount on tea/coffee is available for teachers and coach drivers. We work with various local nursery groups and enjoy our activities with our regular visitors. We can offer half hour Ranger Led Activities to accommodate for the wee ones. Activities include My First Nature Walk. To book complete and return our Nursery Booking Form 2018. We are experienced in working with small and large primary school groups. We love the buzz about the place! We offer a variety of activities that link in with subjects within the Curriculum for Excellence such Biodiversity and Renewables. Below is a list of some of our activities. We are happy to work with you school based on your current curricular subjects and projects, so just let us know. To book complete and email our booking forms below to shop@finlaystone.co.uk There is a booking form for 24 children or less and a different one for 25 children or more. Please specify using the relevant form. Thanks. We are now working with Secondary School groups to help pupils achieve various awards and qualifications such as their SQA’s, John Muir award. We can offer activities to fit in the Curriculum for Excellence such as Outdoor Education and Health and Wellbeing. Our Ranger Team have developed a Junior Ranger Scheme. This is a week to week course to provide training on Ranger skills such as maintenance, conservation and events. Finishing off with a certificate and pupil presentation. Cedar’s School of Excellence, Greenock are now taking part in our Junior Ranger Scheme. Emma Rukin, Social Studies Teacher said “Thanks so much for yesterday afternoon – it was great fun! The girls will really enjoy being outside for an afternoon a week, and in such lovely surroundings. 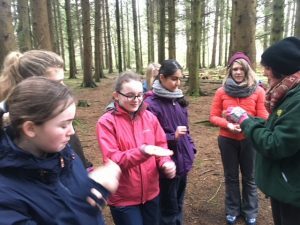 We also provide Ranger Led Activities for secondary schools including Den Builds and Fire Lighting, Team Building Games, Orienteering, Obstacle Course, Renewables, Ranger Hikes, Art in Nature, Seasonal Scavenger Hunts, Flora and Fauna ID and Survey’s. We would also like to work with teachers to create an outdoor classroom for maths, science, arts and geography. If you are interested in working with us or have any questions, call us on 01475540505 or email info@finlaystone.co.uk. We are happy to help. To book a session with our Ranger Team, please complete and return the relevant form for your group if its under 24 pupils or over 25 pupils. We offer various activities for groups including our Ranger Led Activities and overnight stays. To discuss please call 01475540505. We are consistently looking to improve the facilities and activities we provide. Your feedback is welcomed and essential for us to do just that. Please complete our Visitor Feedback Form. We look forward to hearing from you.